It would be a pity to leave South Tipperary without a visit to this wonderful natural phenomenon. 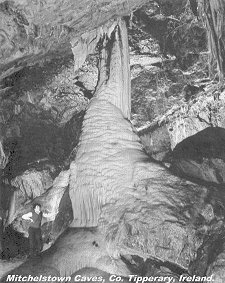 Mitchelstown cave has been carved from the limestone rock by flowing water over millions of years and now contains some of the finest examples in Europe of calcite formations such as stalagmites, stalactites, columns and curtains. Entry is by guided tour only. The guide will take you down the steep steps inside the entrance, through rock lined passageways and eventually into the three massive caverns deep underground. The total distance covered is about 3km. The temperature underground remains at a constant 12 degrees centigrade all year round. The cave was accidently discovered in 1833 by a local man named Michael Condon who was quarrying limestone. It is now owned and maintained by the English family who have done great work over the years to make it accessible to the public.This work has been done with a view to preserving as much as possible the original appearance and natural beauty of the cave. The cave is located about 3 kilometres south of the N8 road between Cahir and Mitchelstown and is signposted from this road.